The resulting impact and emerging issues caused by the increase inoffshore outsourcing of services by U.S. multinational companies havereceived considerable attention in the past five years. This paperapproaches the topic from the customer perspective regarding theoffshoring of customer contact centers (CCCs) and the effects ofservice quality on consumer perception. The empirical study specificallyexamines country-of-origin (COO) effects and other extrinsic product-specific factors that influence consumer perceptions of offshoreoutsourcedservice quality and brand image. A field survey of 242consumers indicates the significant effects of CCC locations on brandequity, as well as the importance of culture and language similarity tothe consumers in the host country. Strategic and managerial implicationsfor international marketers are discussed. Offshoring, or locating a firm’s manufacturing operations across national boundaries, has long been a significant topic of interest and research, ranging from specific organizational cost/benefit analyses to broader economic and international trade issues. Studies have focused on whether such overseas services should be outsourced to an independent organization through a contractual agreement or strategic alliance, or kept insourced or in-house through a majority-owned or wholly owned foreign operation. In recent years, more attention has been paid to the increase in offshore outsourcing of services or business process operations (BPOs) in general and Customer Contact Centers (CCCs) and information technology (IT) support services in particular. Developed countries, including the U.S., have increasingly outsourced service activity to less developed countries, such as India and the Philippines. As recently as 2002, numerous studies cited offshore outsourcing growth trends originating from a number of countries – such as the U.S., the U.K., and Germany – and in various service sector industries, including banking, airlines, information technology, and retailing. The effects on employment are reported by a number of studies indicating the resulting offshore shifts in jobs. For instance, Goldman Sachs cites that between 400,000 and 600,000 U.S. service sector jobs have moved offshore since 2001 (Betts, 2006). Likewise, Forrester Research reported that over the next 15 years, 3.3 million U.S. service industry jobs and $136 billion in wages will move offshore to countries like India, Russia, China, and the Philippines; this overseas exodus will be led by the IT industry (McCarthy, 2002). This prediction was further supported two years later by a follow-up report, which projected that 3.4 million jobs would move overseas in the next 11 years, roughly the same as the long-term 3.3 million jobs estimated in Forrester Research’s original job shift study (Frauenheim, 2004). As a result, according to Datamonitor, more than 250,000 new call center agent positions will be added in India and the Philippines through 2009 (Powell, 2005). Interestingly, about 36% of the agent positions in India were offshore-outsourced at the end of 2004, while 64% were in offshore-insourced (in-house) operations of large multinationals (MNCs). However, this trend is expected to reverse itself by 2007, when offshore outsourcing would dominate by a factor of 10:1. Outsourcing is expected to continue to be the dominant approach to offshoring. For example, according to another study done by consulting firm A.T. Kearney, by 2008 U.S. banks, brokerage firms, insurance companies, mutual funds, and other financial services firms are planning to relocate more than 500,000 jobs offshore, representing 8% of the workforce (A.T. Kearney, 2005). However, such offshore outsourcing popularity and growth is not without its problems or concerns. For instance, while many financial institutions and other service firms look to extend the amount of work carried out in offshore centers, the latest research from management consulting firm DiamondCluster International suggests that the number of firms prematurely terminating contracts with offshore service providers has doubled to 51%, while the number of buyers satisfied with their offshoring providers has fallen from 79% to 62%. Nevertheless, the consulting firm’s annual study of IT outsourcing also found that despite the declining satisfaction with offshoring providers and more buyers ending outsourcing deals early, 74% of buyers expect their use of IT outsourcing to continue to increase in the coming year, up from 64% in 2004 (Frauenheim, 2005). Another recent survey by Bain & Company found that while a significant number of MNCs are outsourcing offshore, almost 50% of the respondents indicated that their international outsourcing experience did not meet their expectations (The Economist, 2005a). Additional research also revealed that overseas services could result in a poor customer service experience and a bad perception, costing the outsourcing company brand equity and goodwill (Marketing News, 2004). Therefore, it is not surprising that in March 2004, credit card behemoth Capital One Financial Corporation canceled its contract with a New Delhi-based firm to outsource a 250-seat call center (Marketing News, 2004), while Dell Inc. relocated its Indian call center support for corporate business to Texas, Iowa, and Tennessee in 2003 (Newsweek, 2004). General Electric now plans to sell its India-based call-center business that boasts an annual revenue of $400 million (King, 2005). American customers were simply not getting the “quality” of service they were accustomed to or expected. Further evidence is found in a study done by Opinion Research Corporation, indicating that 69% of Americans would be less likely to do business with a company after a negative call center experience, while more than 60% of respondents expressed dissatisfaction with their most recent experience with an overseas call center agent (BusinessWeek, 2006a). Many of the quality problems and issues involved in these two trends are rooted in the inherent risks associated with international, and thus cross-cultural, outsourcing. Such issues have spurred continued debate on the benefits and costs associated with offshore outsourcing, both from the perspectives of the firm and the economies involved, particularly in the United States. With this in mind, only a few studies thus far (Sinha & Terdiman, 2002; Buelen, Van Fenema, & Currie, 2005) have examined the link between service and provider quality in the offshore outsourcing experience in terms of the cross-cultural dimensions of BPO delivery and process risk. For example, Sinha and Terdiman (2002) identified and examined the cross-cultural categories of national culture, language and communications, security and privacy, knowledge transfer, business processes, and change management as factors that can influence the outcome of the offshore outsourcing experience for the offshoring firm. A significant part of this debate, which has been studied even less, comes from the perspective of the U.S. consumer and the impact of offshore outsourcing of services on consumer behavior and perception. In an examination of the offshore outsourcing of CCCs, the results of the study done by Kelly Services and Purdue University confirm that the call center experience has a significant impact on how American consumers perceive a company and how likely they are to repurchase from U.S. companies that outsource their customer service calls to offshore locations (Kelly Services, 2004). The purpose of this paper is threefold: (1) to identify issues and concerns involved in the offshore outsourcing of CCCs from a consumer's perspective; (2) to examine the characteristics of countries and products that would affect consumer perception and evaluation of offshore-outsourced CCCs; and (3) to develop management strategies to overcome potential perceptual problems that may arise from the offshore outsourcing of CCCs. Offshoring, or relocating a firm's activities to cross-border overseas locations, has indeed been the focus of considerable research. Studies have primarily centered on the motivations, cost, and benefits to the firm; the economic impact to the related economies; and the problems and issues that emerge from such activity. As a result, researchers and experts have refined their focus, developing new areas of inquiry and clarifying terminology (Erber & Sayed-Ahmend, 2005). As a starting point, ‘onshoring’ refers to the retention of business activity in a firm's home country. In contrast, ‘offshoring’ can be defined as the foreign relocation of business activity (including production of goods or services, distribution, services, research, and development). The term assumes the perspective of the originating firm and the originating country. For example, U.S. firms, such as Dell Inc., have offshored customer support services to India, motivated by lower Indian labor costs but sparking the issue of job loss in the U.S. economy. Additionally, ‘inshoring’ has been defined as the relocation of business activity from the perspective of the destination country. For example, as a result of increased demand from U.S. companies, Indian service providers like Wipro have expanded their capacity for inshoring by creating and training more information technology (IT) support services positions. Other authors have utilized geographic and trade characteristics to further categorize a type of offshoring known as ‘nearshoring,’ which occurs when the location of the destination country is in closer proximity to the originating country. For American firms, as an alternative to true offshore destinations like India or China, nearshoring options could involve Mexico or Canada. For European countries, such as the U.K. or Germany, nearshoring alternatives could be Eastern European countries or Ireland. In general, there are two approaches to conducting offshore activities, namely insourcing and outsourcing. ‘Insourcing’ refers to an offshore activity that is “captive” and essentially controlled (through majority or full ownership, for example) by the offshoring firm. In contrast, ‘outsourcing’ involves offshore activities, such as services, that are provided and controlled by an independent supplier (Lankford & Parsa, 1999; Schniederjans & Zuckweiler, 2004). Outsourcing service providers or suppliers can be further characterized as either ‘native service providers’ (such as IBM or EDS) – meaning they have local operations in different developing countries, yet are headquartered in the developed country or regions – or ‘foreign offshore providers’ (such as Wipro or Tata CS), which are based mainly in developing countries (Buelen, Van Fenema, & Currie, 2005). In our research, we focus on the offshore outsourcing of services, customer contact centers (CCCs) in particular, by U.S. firms. Much of the literature on offshoring has centered on the underlying rationale, such as cost and internationalization advantages (Carmel, 1999). The bulk of the studies have focused on the drivers of foreign manufacturing and foreign direct investment (FDI), starting with a classic work, such as The Future of the Multinational Enterprise by Buckley and Casson (1976), as well as the early research of Caves (1974), which addressed why firms offshore and conduct FDI. Meanwhile, the research on outsourcing has focused primarily on the domestic or onshore outsourcing pioneered by Coase (1937) and his work in establishing transaction cost economics. Some of the more recent literature has investigated the advantages and disadvantages of outsourcing from managerial, financial, operational, and human resource perspectives (Lankford & Parsa, 1999; Yang & Huang, 2000; Allen, Juillet, Paquet, & Roy, 2001; Beaumont & Costa, 2002). The domestic outsourcing decision is not a new concept and is identical to the classic “make-or-buy” decision that firms have been making for decades. The difference, which makes outsourcing an even more critical decision in recent years, is the increased orientation toward international outsourcing or offshore outsourcing. The rationale behind offshore outsourcing is found in the economic theory of comparative advantage (Hall & Soskice, 2001; Forslid & Wooton, 2003). Typically used in the context of inter-country trade, this theory supports the basic economics of offshore outsourcing. Principally, regardless of its geographic location, if an external company can perform tasks more productively than an outsourcing company, the outsourcing firm should allow the external organization to do the work anywhere it chooses. This permits the outsourcing firm to concentrate on what it does better than other companies, which is sometimes called strategic competitive advantages or core competencies (King, Fowler, & Zeitthaml, 2001). Such focus theoretically enables the firm to achieve greater success in its particular market. Offshore outsourcing has been growing at a rapid pace in the last several years (Lee, Huynh, & Kwok, 2003; Zsidish, 2003). As a result, recent research has also focused on the unique advantages and disadvantages of offshore outsourcing, including international legal factors (Lisle, 2003; DiSabatino, 2004) and international risk issues (Zsidish, 2003; Kotabe & Murray, 2004). Offshore outsourcing in manufacturing (e.g., textiles, automobiles, and steel) historically has initiated a rapid growth rate and therefore received a considerable amount of research interest (e.g., Hines & Rich, 1998; Laios & Moschuris, 1999; Dekkers, 2000; Jones, Kierzkowski, & Lurong, 2005; Gorg & Hanley, 2005). However, offshore outsourcing in services, including IT, CCCs, and other business processes, has achieved substantial recent growth, followed by a growing inclusion in the literature (e.g., Heshmati, 2003; Grosman & Helpman, 2005; Leimbach, 2005; Feeny, Lacity, & Willcocks, 2005). Some studies have focused on the advantages and disadvantages specific to offshore outsourcing of services (Weidenbaum, 2004; Schniederjans & Zukweiler, 2004), while others have examined the offshore outsourcing of specific services, such as information systems (Currie, 2000; Soliman, 2003). Nevertheless, there is still a paucity of significant studies into the phenomenon of offshore outsourcing of services. Given the emerging problems associated with the decline in company satisfaction with the offshore outsourcing of services, the resulting cases of firms reversing offshore outsourcing efforts, and the growing issue of its effects on customer behavior, an even greater need exists for further study on this matter – particularly from the perspective of the end-user consumer and in relation to customer perception. This paper seeks to address an element of this need by examining the effects of offshore outsourcing of services, particularly CCCs, on customer perception. Specifically, the study investigates the influence of Country-of-Origin (COO) factors, along with product/service and consumer specific characteristics. This paper observes that the nationality associated with consumer products and services, or their COO, will remain a significant factor in consumer perception and buying behavior (Peterson & Jolibert, 1995; Al-Sulaiti & Baker, 1998; Verlegh & Steenkamp, 1999; De Wet, Pothas, & De Wet, 2001). International marketing literature offers substantial evidence that customers evaluate products or services based on the country in which they are born or are most associated with, and under specific conditions, consumers may exhibit a preference for domestically made alternatives (Shimp & Sharma, 1987; Han, 1988; Granzin & Olsen, 1998; Douglas & Nijssen, 2004). A number of COO studies support the view that consumers have diverse perceptions about products or services made in or associated with foreign countries and that these perceptions affect their behavior based on stereotyped national images of the country of association. Extensive empirical research has been done in this area throughout the past 20 years (e.g., Bilkey & Nes, 1982; Ulgado & Lee, 1993; Peterson & Jolibert, 1995; Verlegh & Steenkamp, 1999; Kaynak & Kara, 2002; Papadopoulous & Heslop, 2002; Inch & McBride, 2004). While the majority of COO research has involved products, the application of COO to services has been studied less often. Nevertheless, Javalgi, Cutler, and Winans (2001) conclude that COO is also significant relative to services. Some studies have focused on specific types of services, such as legal, travel, export assistance, ophthalmology, airlines, and retail (Ofir & Lehman, 1986; Kraft & Chung, 1992; Lascu & Giese, 1995; Harrison-Walker, 1995; Shaffer & O’Hara, 1995; Bruning, 1997). To date, no study has applied COO to customer support services, such as CCCs. It is from this stream of literature that we apply the concept of COO to the case of offshore outsourcing of CCCs and develop the following hypotheses to determine its effects on the perception and behavior of American customers. We posit that in general the COO of the CCC affects the perception and attitudes of the U.S. consumer. More specifically, we consider the determinants of this effect in terms of the level of economic development and cultural similarity. We also examine the possible moderating factors to the COO effect by including other extrinsic cues, such as brand equity and product involvement. To achieve the research goals described in the introduction section of this paper, we conducted a field survey that consisted primarily of two parts. The first part of the survey was comprised of questions exploring the potential issues and concerns involved in the offshore outsourcing of customer contact centers (CCCs) from a consumer’s perspective. These questions will be explained later in the context of the research methodology. The second part of the survey consisted of questions designed to examine the characteristics of countries and products that would affect consumer perceptions and evaluations of offshore-outsourced CCCs. Specifically, the survey was performed to test the following hypotheses; the questions will also be described later in more detail. · Hypothesis 1 : The higher [lower] the level of economic development of the CCC's COO, the higher the positive [negative] effect on consumer attitudes and perception toward the brand and product/ service. · Hypothesis 2a : The greater the cultural similarity between the outsourced country and the home country, the lower the negative effect of COO on consumer attitudes and perception toward the brand and product/service, and vice versa. · Hypothesis 2b : The greater the difference between the native language in the outsourced country and English, the higher the negative effect of COO on consumer attitude and perception toward the brand and product/service, and vice versa. · Hypothesis 2c : The greater the spoken-English accent attributed to the outsourced country, the higher the negative effect of COO on consumer attitudes and perception toward the brand and product /service, and vice versa. · Hypothesis 3 : The stronger [weaker] the brand equity of the outsourcing product/service firm, the weaker [stronger] the COO effect on consumer perception and attitude toward the brand and product/service. · Hypothesis 4 : The higher [lower] the product involvement, the stronger [weaker] the COO effect on consumer perception and attitudes toward the brand and product/service. To select countries for the main survey, we conducted a pilot test in which respondents were asked to consider several countries and indicate the level of economic development, the degree of differences with the U.S. culture, familiarity with the English language, and the degree of spoken-English accent associated with those countries. Seventy-six representative adult respondents participated in the pilot study. Based on the results of the study, we selected five countries – Australia, France, India, Ireland, and the Philippines – for the main study. The pilot study confirmed that customers perceive France as the most economically developed among the five, followed by Australia. Ireland, India, and the Philippines. In addition, the Philippines was regarded as the country with the greatest difference from U.S. culture, followed by India, France, and then Ireland, with Australia having the least cultural difference. In terms of familiarity with the English language, Australia was deemed the most familiar with the English language, followed by Ireland, India, France, and the Philippines. The Philippines was regarded as the country with the highest degree of spoken-English accent, followed by France, Ireland, India, and Australia. To gain better insight into what issues and concerns are involved with the types of products or services associated with offshore outsourcing, we incorporated several exploratory questions into the main survey. In the first section, respondents were asked how likely they would be to switch to a competitor if they found out that the Customer Contact Center (CCC) for the brands/companies they currently use (or would use) was located in India. Their opinion was asked for 13 product and service characteristics, namely financial and banking services; food and beverage products; electronics and appliance products; clothing and apparel stores; computer products and service; long distance telephone providers; health-care services; airlines; utilities (electric, gas, cable TV); cellular phone services; office supplies; cosmetics; and insurance services. India was selected for the study because it was one of the least economically developed countries among the five countries in the study, and it was actually one of the fastest growing countries for offshore outsourcing businesses. The final part of the questionnaire asked respondents to rate, according to their level of importance, their general concerns about locating CCCs overseas. Specific questions asked about credit card information/transaction security; communication difficulties; negative impact on the domestic economy; performance of the product they were calling about; general personal information privacy; significant job loss in the home country; attitude-related differences due to cultural differences; accuracy of information/responses given by the call center; the quality of product or service they had purchased; identity theft; product (service) fulfillment delays/errors in processing or delivery; conflict with patriotism; and the performance of the service about which they would be calling. The main survey was designed for testing the research hypotheses described earlier. In the questionnaire, respondents were asked to indicate how they felt (on a 7-point Likert scale) about the brand and the product (or service) when they realize during their customer service experience that the call center is located in an offshore-outsourced CCC in each of the five specified countries (Australia, France, India, Ireland, and the Philippines). Respondents were further asked about their opinion for call centers in each country under varying conditions. 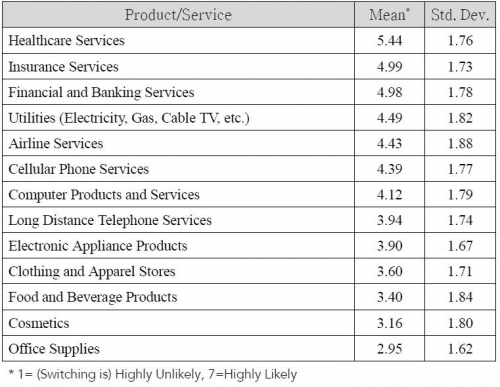 The situations were manipulated across different product/service categories (e.g., apparel, consumer electronics, wireless phone service, banking services) and different levels of brand equity (i.e., actual high equity brand vs. a fictitious, no-equity brand). The final section asked for classification information about the respondent. Responses from a convenience sample of 242 consumers in a Southeastern United States urban area were used for this study. The survey responses of 242 adults were used for the study. The population was comprised of 122 females (50.5%) and 120 males (49.5%). The age ranges varied from 18 to 24 years old (23%), 25 to 34 (45%), 35 to 45 (12%), 46 to 55 (16%), and 56 to 65 (4%). A significant majority of the respondents were well-educated, having attended a 4-year college (87%). Among the balance of the sample population, 8% earned a high school diploma while 2% finished graduate school. The occupational background of the respondents was distributed among professional services and consumer services (25% and 20%, respectively), business services (20%), student (15%), technical products (10%), and retail (10%). All respondents were located in a large metropolitan area of the Southeastern United States. In the first section of our exploratory survey, respondents were asked about the likelihood that they would switch to a competitor if they discovered the Customer Contact Center (CCC) for the brands they use currently was located in India. The results are summarized in Table 1. It was observed that people reacted very sensitively when it came to high-involvement service items, such as health-care services (M=5.44), insurance services (M=4.99), and financial/banking services (M=4.98). On the contrary, they did not react sensitively in the case of low-involvement products, such as office supplies (M=2.95), cosmetics (M=3.16), and food and beverage products (M=3.40). The results suggest that people consider the country-of-origin (COO) information more important when they evaluate high-involvement items. In the second section of the questionnaire, respondents were asked to rate their level of agreement with 13 statements regarding foreign toll-free customer service call centers located overseas. The purpose of this section was to identify important issues associated with offshore outsourcing. The results are presented in Table 2. Respondents thought that the language (M=5.20) and cultural differences (M=4.90) would be the most serious concerns. They also responded that they would not mind the foreign-based service centers for relatively small, low-cost purchases, a finding consistent with the first section. In the final section, respondents were asked to rate the importance of the issues and concerns involved in obtaining services from the foreign-based CCCs. The results are shown in Table 3. 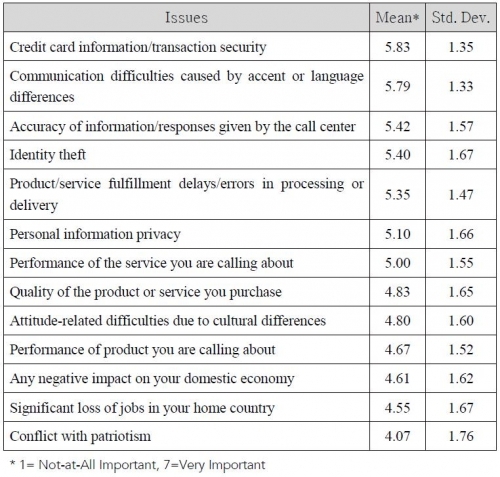 Interestingly, respondents considered credit card information/ transaction security (M=5.83), communication difficulties (M=5.79), accuracy of information (M=5.42), and identity theft (M=5.40) as the most important. In other words, people considered protection of privacy information and communication as the most serious issues. Responses to the main survey were used for examining the hypotheses. Hypotheses were tested through investigating the differences of ratings on actual and/or fictitious alternatives. Hypothesis 1 proposes that the lower [higher] the level of economic development of the CCC's COO, the higher the negative [positive] effect on consumer attitude and perception toward the brand. Respondents were asked to rate their attitude and perceptions toward a home theater system manufactured by a hypothetical company when they realized that its customer service representative was located in the five countries under study. Table 4 exhibits the means and standard deviations of the ratings. As shown in the table, the Philippines and India were rated low (Ms=3.05 and 2.90, respectively), whereas Ireland and Australia were rated high (Ms=3.41 and 3.68, respectively). The most surprising result was the fact that France, which was perceived as the most developed country among the five, was rated very low (M=2.95). Thus, Hypothesis 1 was partially supported. Hypothesis 2a suggests that the greater the cultural similarity between the outsourced country and the home country, the lower the negative effect of COO on consumer attitudes and perceptions toward the brand. It was found in the pilot study that U.S. respondents felt Australia and Ireland are the most similar, whereas the Philippines and India are the least similar to their own culture. France was perceived to be in between these two groups. In the main survey, they were asked how they felt about prepaid long distance phone cards when the call centers were located in the five countries. Table 5 shows their mean ratings. As presented in the table, all of the countries were rated low with the exception of Australia and Ireland, which were ranked the highest (Ms=4.10 and 3.92, respectively). Thus, Hypothesis 2a was supported. Hypothesis 2b posits that the greater the difference between the native language in the outsourced country and English, the higher the negative effect of COO on consumer attitude and perception toward the brand. The pilot test indicated that American respondents considered the Australian and Irish languages similar to theirs, while the Filipino, French, and Indian languages were perceived as different from theirs. Respondents were asked to evaluate a cellular phone and long distance service with a service center located in the five different countries. Table 6 presents the results. As shown in the table, Australia and Ireland were rated high (Ms= 3.68 and 3.45, respectively) whereas the Philippines, India, and France were rated low (Ms=3.04, 2.93, and 3.00, respectively). Therefore, Hypothesis 2b was also supported. Hypothesis 2c proposes that the greater the spoken-English accent attributed to the outsourced country, the higher the negative effect of COO on consumer attitude and perception toward the brand. The pilot study revealed that U.S. respondents thought the Filipino and French had quite different accents, whereas the Australians and Indians did not. The Irish were in between these two groups. In the main questionnaire, the respondents were asked to evaluate a debit card when they found out that the company’s customer service center is located in the five countries. Table 7 exhibits the means of the ratings. The results show that people evaluated services from the Philippines and France—associated with strong accents—more unfavorably (Ms= 2.72 and 2.75, respectively), whereas they reacted to services from Australia—associated with a less strong accent—more favorably (M=3.29). The results also indicate that respondents evaluated services from India less favorably (M=2.57). Thus, Hypothesis 2c was partially supported. Consistent with the findings of the exploratory analysis, the results from testing Hypothesis 2a, 2b, and 2c again underscore the importance of cultural and language similarity for the success of the offshore outsourcing of services. Hypothesis 3 suggests that the stronger the brand equity of the outsourcing product/service firm, the weaker the COO effect on consumer perception and attitude toward the brand. It implies that the strong brand effect can outweigh the negative COO effect. The pilot study results showed that the Philippines had the most negative COO image whereas France had the most positive image. Respondents were asked to rate the well-known mail-order clothing and apparel retailer Land’s End with the idea that its service center was located in those two countries. Then, they were asked again to rate the less known, California-based shoe retailer Shoe Warehouse as if its toll-free customer service was located in those two countries. The data were analyzed through the framework of brand equity (2: strong versus weak) x country image (2: positive versus negative) within-subject design. Table 8 presents the mean ratings in those conditions. An ANOVA (Analysis of Variance) procedure showed that an interaction effect existed, which was only directionally significant (F=3.40, p=.07). Neither the main effect of the brand (F=1.14, p >.29) nor that of the country (F=.04, p>.85) was significant. The mean ratings of different conditions provided some interesting insight. When the customer service was located in the country associated with a negative image, the brand equity did not make any difference (Ms=3.36 vs. 3.35, t=.06, p >.95). On the other hand, when it came to the country with a positive image, the ratings increased with the strength of the brand name (Ms=3.27 vs. 3.41, t=1.84, p =.06). Although the difference of the means did not reach the level of significance, this implies that the brand equity of the outsourcing firm can have a strong effect when the service center is located in a country with a positive image. Thus, Hypothesis 3 was only directionally supported. Hypothesis 4 proposes that the higher the product involvement, the stronger the COO effect on consumer perception and attitude toward the brand. This means that people would feel sensitive to the COO information when purchasing an expensive and important item. Respondents were asked to rate both France and the Philippines if they were to purchase a personal computer (i.e., Dell) and if they were to be provided cellular phone services (i.e., T-Mobile) when the customer service representative was in those countries. The data was again analyzed through a country image (2: positive versus negative) x product involvement (2: high versus low) ANOVA. Table 9 presents the means of the ratings. In this instance, neither significant interaction (F=.74, p >.39) nor main effects (F=1.54, p >.21; F=.13, p >.71) were apparent. Thus, Hypothesis 4 was not supported in this survey. However, it is noted that for the high-involvement product there was some difference in the means between the negative versus positive country image condition (Ms=3.04 vs. 3.20, t=.63, p >.53). Although the difference did not reach the level of significance, it is speculated that people would react to the country information more sensitively for high-involvement products than they would for low-involvement products. In fact, this was confirmed in the analysis of the exploratory survey data (see Table 1). Respondents reacted sensitively to the CCC's COO information when they dealt with high-involvement services, such as health care, insurance, and financial services. A possible explanation could be that a difference in COO effects exists across levels of high involvement and between high-involvement products versus high-involvement services. The results of hypothesis testing are summarized in Table 10. As the exploratory survey begins to suggest, companies considering offshore outsourcing of their customer contact centers (CCCs) need to recognize that potential cultural and language differences that can result in communication difficulties are of the utmost concern to their American consumers. Moreover, while there are often-cited benefits to offshore outsourcing of CCCs from the perspective of the firm, American managers should keep in mind that offshore outsourcing of customer services may not be for everyone. When high-involvement services, such as health care, insurance, and financial/banking services, are offshore-outsourced, U.S. consumers are willing and most likely to switch to a competitor. Additionally, they are concerned about the associated increased security, information accuracy, and privacy risks. Companies like United Healthcare, State Farm, or Citibank may need to consider more carefully the risks and impacts offshore outsourcing may have on customer satisfaction. However, for companies that are associated with relatively low-involvement products, such as Staples (office supplies), Pepsi Cola (food and beverages), or Maybelline (cosmetics), the implications of the offshore outsourcing of their CCCs may not be as critical to customer perception. American consumers are more open to foreign-based service centers when it involves relatively low-cost, low-involvement purchases. The results of the study indicate further that the level of economic development of the CCC’s country-of-origin (COO) can adversely affect consumer perception and attitude regarding the CCC service, as well as the corresponding product and brand. This negative effect can be a significant factor that can override the low labor cost advantages of placing CCCs in lesser developed countries, such as India or the Philippines. Companies may want to consider more developed offshore environments, such as Ireland or Australia, to outsource CCCs. However, in addition to economic development, other offshore outsourcing factors that can possibly affect customer behavior should also be examined. The study showed that a positive COO effect and consumer perception was still low for France, despite being perceived as the most developed alternative. Therefore, it is possible that besides the level of the French economy, U.S. consumers can also be influenced by other considerations, including ethnocentrism, anti-French sentiment, patriotism, cultural dissimilarity, and language disparity. Thus, while firms should definitely consider economic development in offshore outsourcing location decisions, they must also include other potential factors that can influence consumer perception. As further evidenced by this study, cultural similarity is another factor that can significantly influence the COO phenomenon. Offshored CCCs located in cultures or countries that are perceived as distinctly different from American culture – namely India, France and the Philippines – can lead to significant negative customer perception and attitude. Therefore, U.S. firms should weigh typical offshore outsourcing benefits, such as cost savings, against the detrimental effects of cultural dissimilarity on consumer perception. Selecting countries that are more culturally similar, such as Australia or Ireland, and that offer labor cost advantages can minimize this effect. For example, the emerging trend toward nearshoring of call centers has been observed in Europe, where the cultural and linguistic affinity across neighboring countries is greater (The Economist, 2005b). The results of the study strongly indicate that language is a very important element of cultural similarity. Indeed, the high degree of verbal communication in CCCs dictates the prominent role of language in achieving the facilities’ customer service objectives. American consumers seem to have strong negative perceptions and attitudes toward customer services if the language associated with the COO of the CCC is perceived as significantly different from English (such as Filipino, French, or Indian). As a result, firms catering to the U.S. market should offshore outsource CCCs in countries (such as Australia or Ireland) whose language more closely resembles English. For companies that maintain offshore customer services in countries like India or the Philippines, substantial English language education and training of their CCC staff would be a critical factor to their offshoring success. Since CCCs typically involve verbal telephone communication without the added help of visual tools, dimensions of language other than the technical translation are also critical to developing a more positive customer impression. The firm's offshore CCC operations should avoid the negative effects of significantly different voice accents, speed, inflection, and tone; they should maintain the use of colloquial terms, idioms, and expressions by selecting offshore environments that are relatively similar in this manner to what U.S. consumers are familiar with. Alternatively, in offshore locations that have distinct differences across these language dimensions, the English language education and training previously prescribed should also include an adequate component on cultural conventions regarding language and verbal communication. For example, Mumbai-based TransWorks trains potential customer service employees to not only develop their American speech, but also to develop their American attitudes. Meanwhile, offshore outsourcing companies need to bear in mind that consumer perception of the country location of CCCs can possibly influence brand equity. A positive country image associated with the offshored CCC location can potentially enhance the favorable influence of a strong brand on consumer behavior. The findings of this study suggest that, from a managerial perspective, decision- makers (particularly those concerned with U.S. consumers and their perceptions) need to carefully consider strategic alternatives to CCC locations other than offshore outsourcing. While offshore outsourcing of CCCs typically provides cost advantages, these could very well come at the expense of goodwill and customer satisfaction. Therefore, the firm has essentially two options: either improve the offshore call center experience, or select an alternative to offshoring. The offshore CCC experience can be improved by gaining better control of such operations, either through ownership or insourcing of the offshore facilities and/or establishing more effective education, training, and standards in the industry. For example, western and U.S.-based service firms are increasingly acquiring Indian companies as India’s outsourcing industry consolidates (BusinessWeek, 2006b). Others have simply increased investment and emphasis on employee training and development, such as accent-neutralization classes and American cultural immersion sessions. Meanwhile, industry-wide efforts to educate and train people in telephone mediated communications have been launched, as illustrated by the establishment of the Call Centre College in London. Similarly, six firms – Microsoft, Novell, Dell, Clasris, Adobe, and Compaq – formed the New York-based Customer Outsourcing Performance Center, Inc. (COPC) to manage the standards developed for outsourced providers of customer service and offer certification services. However, actions that seek to improve the offshored CCC also tend to increase costs and do not guarantee success, as some cross-cultural issues will always persist. Another solution would be to resort to offshoring alternatives, such as nearshoring or onshoring. U.S. firms can nearshore CCCs in geographically and culturally closer countries, such as Canada, Mexico, or even South American countries. Latin America, for example, has recently become the newest region for U.S. corporations to outsource CCCs (Marketing News, 2006b). Firms that cater to American consumers should also consider onshoring, or choosing domestic locations for CCCs, as offshoring is not for everyone. While firms like Dell Inc. moved back from India to the U.S., companies like AAA of Minnesota and Iowa and Home Shopping Network (HSN) never left and continue to rely on domestic outsourcers. While it is typically cheaper to locate call centers overseas, firms can still find cost effective alternatives within the United States while eliminating the cultural, language and security issues of offshoring. For example, Cingular Wireless renovated an abandoned Wal-Mart in Ocean Springs, Mississippi, and adapted it to become an 800-person call center. Other companies have discovered that Native American alternatives are even more cost effective than their counterparts in Asia. For instance, the National Library of Medicine (NLC) has utilized outsourcer Lakota Technologies Inc., which is owned and operated by the Cheyenne River Sioux Tribe in Eagle Butte, South Dakota; Wave Technologies, Inc., another Native American service provider, has a CCC located in Lumberton, North Carolina. Another growing phenomenon in onshore outsourcing that corporations should consider is virtual outsourcing, or ‘homeshoring.’ More and more companies are not only moving customer service jobs out of offshore locations, but also out of onshore, high- overhead, brick-and-mortar call centers and into what is arguably the lowest-overhead location: American homes. Well-known companies like 1-800-Flowers.com and Jetblue Airways have increasingly relied on such practices, involving both their own insourced employees and independent contractor personnel offered by outsourcing companies. Outsourced homeshoring grew 20% last year and is expected to triple in size by 2010 (BusinessWeek, 2006c). Further studies should be conducted with different countries and different products/services in various settings to test and extend the generalizability of these results. In the present study, due to the nature of the convenience sampling procedure, the respondents may not be representative of the U.S. population. Thus, future research should be conducted to test the external validity of the results by examining more diverse products, services, and countries. In addition, the current study focused on how U.S. consumers felt about offshore-outsourced services. Further research is also needed to investigate the cross- national or cross-cultural differences in consumer perceptions and evaluations of such service centers. The overall results of the study indicate that the offshore outsourcing of services, such as Customer Contact Centers (CCCs), can have a significant impact on consumer perception and attitude. Depending on the type of service or product involved, American consumers may even be driven to switch to a competitor due to foreign-based customer service centers. Their main concerns stem from cultural and language differences that can lead to problems in communication. The study also shows that offshore customer service locations heighten U.S. customers' sensitivity toward financial transaction security, personal health, and information accuracy issues. The supported hypotheses contend that cultural, language, and economic development dissimilarities tend to increase the negative effect of offshore outsourcing of CCCs. This influence on consumer perception should motivate managers to look beyond the obvious cost advantages of offshore outsourcing of CCCs. In developing their customer support strategies, firms also need to consider the consumer perception and satisfaction advantages associated with CCC location alternatives. 1.A.T. Kearney. (2005). Outsourcing strategically for sustainable competitive advantage. CAPS Research, Tempe, AZ. 2.Ahmed, Z. U., Johnson, J. P., Yang, X., Fatt, C.K., Teng, H.S., & Boon, L.C. (2004). Does country of origin matter for low-involvement products? International Marketing Review, 21(1): 102-120. 3.Al-Sulaiti, K. I., & Baker, M.J. (1998). Country of origin effects: A literature review. Marketing Intelligence & Planning, 16(3): 150-199. 4.Allen, B. A., Juillet, L., Paquet, G., & Roy, J. (2001). E-governance and government online in Canada: Partnerships, people and prospects. Government Information Quarterly, 18: 93-104. 5.Beaumont, N., & Costa, C. (2002). Information technology outsourcing in Australia. Information Resources Management Journal, 15: 14-31. 6.Betts, M. (2006). Offshoring: Not a passing phase. Computerworld, computerworld.com, February 22. 7.Bilkey, W. J., & Nes, E. (1982). Country-of-origin effects on consumer evaluations. Journal of International Business Studies, 8(1): 89-99. 8.Bruning, E. R. (1997). Country of origin, national loyalty and product choice. International Marketing Review, 14(1): 59-74. 9.Buckley, P., & Casson, M. (1976). The future of the multinational enterprise. New York: Holmes and Meier. 10.Buelen, E.,Van Fenema, P., & Currie, W. (2005). From application outsourcing to infrastructure management: Extending the offshore outsourcing service portfolio. European Management Journal, 23(2):133-144. 11.BusinessWeek. (2006a). The future of outsourcing. BusinessWeek, January 30: 50-64. 12.BusinessWeek. (2006b). Open season on outsourcers. BusinessWeek, April 17: 48-49. 13.BusinessWeek. (2006c). Call centers in the rec room. BusinessWeek, January 23: 76-77. 14.Carmel, E. (1999). Global software teams, collaboration across borders and time zones. New Jersey: Prentice-Hall. 15.Cattin, P., Jolibert, A., & Lohnes, C. (1982). A cross-cultural study of 'made-in' concepts. Journal of International Business Studies, 8(Winter): 131-141. 16.Caves, R.E. (1974). Multinational firms, competition, and productivity in host-country markets. Economica, 41: 176-193. 17.Chao, P. (1989). The impact of country affiliation on the credibility of product attribute claims. Journal of Advertising Research, 29(April- May): 35-41. 18.Chao, P. (1993). Partitioning country-of-origin effects: Consumer evaluations of a hybrid product. Journal of International Business Studies, 24(2): 291-306. 19.Coase, R. (1937). The nature of the firm. Economica, 4: 386-405. 20.Cordell, V. V. (1993). Interaction effects of country of origin with branding, price and perceived performance risk. Journal of International Consumer Marketing, 5(2): 5-18. 21.Currie, W. (2000). The supply-side of IT outsourcing: The trend towards mergers, acquisitions and joint ventures. International Journal of Physical Distribution & Logistics Management, 30(3/4): 238-254. 22.Darling, J. R., & Wood, V. R. (1989). A longitudinal study comparing perceptions of U.S. and Japanese consumers in a third/neutral country: Finland 1975-1985. Journal of International Business Studies, 19(Fall): 427-450. 23.De Wet, A. G., Pothas A-M., & De Wet, J.M. (2001). Countryof- origin: Does it matter? Total Quality Management, 12(2): 191-200. 24.Dekkers, R. (2000). Decision models for outsourcing and core competencies in manufacturing. International Journal of Production Research, 38(17): 4085-4096. 25.DiSabatino, J. (2004). Outsourcing software management raises legal questions. FS Outsourcing, 28 February, available at www.fsoutsourcing.com. 26.Douglas, S. P., & Nijssen, E. J. (2004). Examining the animosity model in a country with a high level of foreign trade. International Journal of Research in Marketing, 21:23-38. 27.Economist, The. (2005a). Outsourcing: Time to bring it back home? The Economist, March 5: 63. 28.Economist, The. (2005b). The rise of nearshoring. The Economist, December 3: 65-66. 29.Erber, G., & Sayed-Ahmed, A. (2005). Offshore outsourcing a global shift in the present IT industry. Intereconomics, March/April: 100-112. 30.Feeney, D., Lacity, M., & Willcocks, L.P. (2005). Taking the measure of outsourcing providers. MIT Sloan Management Review, 46(3): 41-48. 31.Forslid, R., & Wooton, I. (2003). Comparative advantage and the location of production. Review of International Economics, 11(4): 588-604. 32.Frauenheim, E. (2004). Study supports controversial offshore numbers. ZDNet News, zdnet.com, May 17. 33.Frauenheim, E. (2005). Offshore outsourcing satisfaction drops. CNet News, news.com, June 8. 34.Gaedeke, R. (1973). Consumer attitudes toward products 'made in' developing countries. Journal of Retailing, 49(Summer): 13-24. 35.Gorg, H., & Hanley, A. (2005). Labour demand effects of international outsourcing: Evidence from plant-level data. International Review of Economics and Finance, 14:365-376. 36.Granzin, K. L., & Olsen, J. E. (1998). Americans' choice of domestic over foreign products: A matter of helping behavior? Journal of Business Research, 43:39-54. 37.Grossman, G. M., & Helpman, E. (2005). Outsourcing in a global economy. Review of Economic Studies, 72: 135-159. 38.Hall, P., & Soskice D. ((Eds) (2001). Varieties of capitalism: The institutional foundations of comparative advantage. Oxford: Oxford University Press. 39.Han, C. M. (1989). The role of consumer patriotism in the choice of domestic versus foreign products. Journal of Advertising Research, June/July: 25-32. 40.Han, C. M., & Terpstra, V. (1988). Country-of-origin effects for uninational and bi-national products. Journal of International Business Studies, Summer: 235-255. 41.Harrison-Walker, L.J. (1995). The relative effects of national stereotype and advertising information on the selection of a service provider. Journal of Services Marketing, 9(1): 47-59. 42.Hastak, M., & Hong, S. (1991). Country-of-origin effects on product quality judgments: An information integration perspective. Psychology and Marketing, 8(2): 129-143. 43.Heshmati, A. (2003). Productivity growth, efficiency and outsourcing in manufacturing and service industries. Journal of Economic Surveys, 17(1): 79-112. 44.Heslop, L. A., Papadopoulos, N., & Bourke, M. (1998). An interrogation and intercultural perspective on subcultural differences in product evaluation. Canadian Journal of Administrative Sciences, 15(2): 113-127. 45.Hines, P., & Rich N. (1998). Outsourcing competitive advantage: The use of supplier associations. International Journal of Physical Distribution & Logistics Management, 28(7): 524-546. 46.Inch, G. S., & McBride, J. B. (2004). The impact of country-of-origin cues on consumer perceptions of product quality: A binational test of the decomposed country-of-origin construct. Journal of Business Research, 57: 256-265. 47.Jaffe, E. D., & Nebenzhal, I.D. (2001). National image and competitive advantage: The theory and practice of country-of-origin effect. Copenhagen: Copenhagen Business School Press. 48.Javalgi, R. G., Cutler, B. D., & Winans, W. A. (2001). At your service! Does country of origin research apply to services? Journal of Services Marketing, 15(7): 565-582. 49.Jo, M-S., Nakamoto, K., & Nelson, J. (2003). The shielding effects of brand image against lower quality countries-of-origin in global manufacturing. Journal of Business Research, 56: 637-646. 50.Johansson, J. K., & Nebenzhal, I.D. (1986). Multinational production: Effect on brand value. Journal of International Business Studies, 17(3): 101-126. 51.Johansson, J. K., Douglas, S. P., & Nonaka, I. (1985). Assessing the impact of country of origin on product evaluations: A new methodological perspective. Journal of Marketing Research, 22(4): 388-396. 52.Jones, R., Kierzkowski, H., & Lurong, C. (2005). What does evidence tell us about fragmentation and outsourcing? International Review of Economics and Finance, 14:305-316. 53.Kaynak, E., & Cavusgil, T.S. (1983). 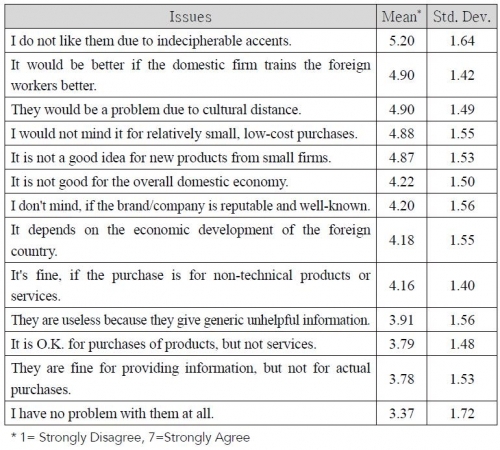 Consumer attitudes towards products of foreign origin: Do they vary across product classes. Journal of International Advertising, 2(2): 147-157. 54.Kaynak, E., & Kara A. (2002). An examination of the relationship among consumer lifestyles, ethnocentrism, knowledge structures, attitudes and behavioral tendencies: A comparative study in two CIS states. International Journal of Advertising, 20: 455-482. 55.Kelley Services Inc. (2004). Offshore company call centers a concern to U.S. consumers. Kelly Services News Release, Troy, Michigan, September 21. 56.Khanna, S. R. (1986). Asian companies and the country stereotype paradox: An empirical study. Columbia Journal of World Business, Summer: 29-38. 57.King, W. (2005). Outsourcing becomes more complex. ISM Journal, Spring: 89-90. 58.King, A., Fowler, S., & Zeithaml, C. (2001). Managing organizational competencies for competitive advantage: The middle-management edge. Academy of Management Executive, 15(2): 95-107. 59.Kotabe, M., & Murray, J. Y. (2004). Global sourcing strategy and sustainable competitive advantage. Industrial Marketing Management, 33(1): 7-15. 60.Kraft, F. B., & Chung, K.H. (1992). Korean importer perceptions of US and Japanese industrial goods exporters. International Marketing Review, 9(2): 59-73. 61.Krishnakumar, P. (1974). An exploratory study of the influence of country of origin on product images of persons from selected countries. Ph.D. Dissertation, University of Florida, Gainesville, FL. 62.Laios, L., & Moschuris, S. (1999). An empirical investigation of outsourcing decisions. The Journal of Supply Chain Management, Winter: 33-41. 63.Lascu, D. N., & Giese, T. (1995). Exploring country bias in a retailing environment: Implications of retailer country of origin. Journal of Global Marketing, 9(1/2): 41-58. 64.Lankford, W. M., & Parsa, F. (1999). Outsourcing: A primer. Management Decision, 37: 310-316. 65.Lee, J-N., Huynh, M. Q., & Kwok, R. C-W. (2003). IT outsourcing evolution–past, present, and future. Communications of the ACM, 46(5): 84-90. 66.Leimbach, M. P. (2005). Invited reaction: Outsourcing relationships between firms and their training providers: The role of trust. Human Resource Development Quarterly, 16(1): 27-32. 67.Li, W. K., & Wyer, R. S. (1994). The role of country of origin in product evaluations: Informational and standard-of-comparison effects. Journal of Consumer Psychology, 3(2): 187-212. 68.Lin, L-W., & Sternquist, B. (1994). Taiwanese consumers' perceptions of product information cues: Country of origin and store prestige. European Journal of Marketing, 28(1): 5-18. 69.Lisle, C. (2003). Outsource a core competency? Why private equity groups are outsourcing business strategy due diligence. Journal of Private Equity, 7(1): 72-76. 70.Maheswaran, D. (1994). COO as a sterotype: Effects of consumer expertise and attribute strength on product evaluations. Journal of Consumer Research, 21(2): 354-365. 71.Marketing News. (2004). Overseas call centers can cost firms goodwill. Marketing News, April 15: 21. 72.McCarthy, J. C. (2002). 3.3 million US service jobs to go offshore. Forrester Research, forrester.com, November 11. 73.Miyazaki, A. D., Grewal, D., & Goodstein, R.C. (2005). The effect of multiple extrinsic cues on quality perceptions: A matter of consistency. Journal of Consumer Research, 32: 146-152. 74.Newsweek. (2004). Should I stay or should I go? Newsweek, April 19: 52-53. 75.Ofir, C., & Lehman, D. R. (1986). Measuring images of foreign products. Columbia Journal of World Business, Summer: 105-109. 76.Papadopoulos, N., & Heslop, L. (2002). Country equity and country branding: Problems and prospects. Journal of Brand Management, 9(4-5): 294-314. 77.Papadopoulos, N., Heslop, L., & Beracs, J. (1990). National stereotypes and product evaluations in a socialist country. International Marketing Review, 7(1): 32-47. 78.Peterson, R. A., & Jolibert, A. J. (1995). A meta-analysis of countryof- origin effects. Journal of International Business Studies, 26(4): 157-175. 79.Powell, R. (2005). The future of contact center outsourcing in India and the Philippines. Datamonitor, March 29. 80.Russell, R. S., & Taylor, B. W. (2003). Operations Management, 4th Edition. Upper Saddle River, NJ: Prentice Hall. 81.Schniederjans, M. J., & Zuckweiler, K. M. (2004). A quantitative approach to the outsourcing-insourcing decision in an international context. Management Decision, 42(8): 974-986. 82.Schooler, R. D. (1971). Bias phenomenon attendant to marketing of foreign goods in the US. Journal of International Business Studies, 2(Spring): 71-80. 83.Shaffer, T. R., & O'Hara, B.S. (1995). The effects of country-of-origin on trust and ethical perceptions of legal services. Service Industries Journal, 15(2): 162-185. 84.Sharma, S., Shimp, T. A., & Shin, J. (1995). Consumer ethnocentrism: A test of antecedents and moderators. Journal of the Academy of Marketing Science, 23(1): 26-37. 85.Shimp, T. A., & Sharma, S. (1987). Consumer ethnocentrism: Construction and validation of the CETSCALE. Journal of Marketing Research, 24: 280-289. 86.Sinha, D., & Terdiman R. (2002). Potential risks in offshore sourcing. Gartner Research September 5. 87.Soliman, K. (2003). A framework for global IS outsourcing by application service providers. Business Process Management Journal, 9(6): 735-744. 88.Srinivasan, N., Jain, S. C., & Sikand, K. (2004). An experimental study of two dimensions of country-of-origin (manufacturing country and branding country) using intrinsic and extrinsic cues. International Business Review, 13: 65-82. 89.Szybillo, G. J., & Jacoby, J. (1974). Intrinsic versus intrinsic cues as determinant of perceived product quality. Journal of Applied Psychology, 59(1): 74-78. 90.Tongberg, R.C. (1972). An empirical study of relationships between dogmatism and consumer attitudes toward foreign products. Ph.D. Dissertation, Pennsylvania State University, University Park, PA.
91.Tse, D. K., & Gorn, G. J. (1993). An experiment on the salience of COO in the era of global brands. Journal of International Marketing, 1(1): 57-76. 92.Tse, D. K., & Lee, W. (1993). Removing negative country images: Effects of decomposition, branding and product experience. Journal of International Marketing, 1(3): 25-48. 93.Ulgado, F. M., & Lee, M. (1993). Consumer evaluations of bi-national products in the global market. Journal of International Marketing, 1(3): 5-22. 94.Verlegh, P., & Steenkamp, J-B. (1999). A review and meta-analysis of country-of-origin research. Journal of Economic Psychology, 20: 521-546. 95.Wall, M., & Heslop, A. (1986). Consumer attitudes toward Canadian made versus imported products. Journal of the Academy of Marketing Science, 14(Summer): 27-36. 96.Wall, M., Leifeld, J., & Heslop, A. (1991). Impact of country-of-origin cues on consumer judgments in multi-cue situations: A covariance analysis. Journal of the Academy of Marketing Science, 8(4): 345-367. 97.Wang, C-K., & Lamb, C.W. (1983). The impact of selected environmental forces upon consumers' willingness to buy foreign products. Journal of the Academy of Marketing Science, 11(2): 71-83. 98.Watson, J. J., & Wright, K. (2000). Consumer ethnocentrism and attitudes toward domestic and foreign products. European Journal of Marketing, 34(9/10): 1149-1166. 99.Weidenbaum, M. (2005). Outsourcing: Pros and cons. Business Horizons, 48: 311-315. 100.Yang, C., & Huang, J. B. (2000). A decision model for IS outsourcing. International Journal of Information Management, 20: 225-239. 101.Yaprak, A. (1978). Formulating a multinational marketing strategy: A deductive cross-national consumer behavior model. Ph.D. Dissertation, Georgia State University, Atlanta, GA.
102.Zsidish, G. A. (2003). Managerial perspectives on supply risk. Journal of Supply Chain Management, 39(1): 14-26.